Hokkaido (Japan) – January 10, 2018 (travelindex) – Best Western Hotels and Resorts will arrive at one of Japan’s busiest airports in 2018, with the launch of a brand new upper-midscale hotel. Scheduled to welcome its first guests in May 2018, Best Western Plus Hotel Fino Chitose is situated just 3.2km from New Chitose Airport, the main domestic and international gateway to the island of Hokkaido. 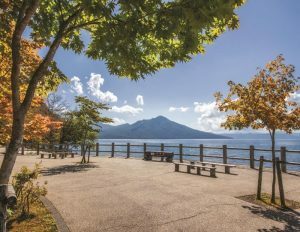 This convenient location places guests within easy reach of some of the island’s most desirable business and tourism destinations, including Sapporo, Hokkaido’s largest city and administrative center; and Niseko, the major ski resort and outdoor adventure hub. The hotel also becomes one of the closest internationally-branded hotels to New Chitose, Japan’s fifth busiest airport. Handling more than 20 million passengers per year, this major air hub provides direct connections to and from major cities all across Asia and beyond, including Hong Kong, Singapore, Bangkok, Shanghai and Kuala Lumpur. “With its snow-capped peaks, national parks and fresh mountain air, Hokkaido is a natural paradise for visitors – especially those from Asia’s most crowded cities. So it is no surprise that the island is welcoming a rising number of international visitors, the vast majority of whom travel through New Chitose Airport,” commented Olivier Berrivin, Best Western Hotels & Resorts’ Managing Director of International Operations – Asia. “With the launch of Best Western Plus Hotel Fino Chitose in May 2018, we will be able to offer travelers a world-class upper-midscale hotel within easy reach of New Chitose Airport. Suited to both business and leisure travelers, including families, this exceptional new property will be ideal for guests wanting to break up their journey to and from Hokkaido, or those seeking a convenient base for their activities on the island,” Olivier added. Best Western Plus Hotel Fino Chitose will feature a total of 154 guest rooms, including a selection of Japanese-style family rooms for up to four guests. All rooms come equipped with modern facilities including flat-screen TVs, kettles and complimentary Wi-Fi. The hotel will also feature a 24-hour front desk, daily housekeeping and laundry, supported by Best Western’s world-famous service standards. The signing of this new hotel comes just weeks after Best Western returned to the island of Hokkaido with the launch of the 60-room Best Western Sapporo Odori-Koen in downtown Sapporo. Hokkaido hosts a year-round calendar of events, including the famous Sapporo Snow Festival which attracts more than two million people each year. The nearby Niseko area is quickly developing a global reputation for its world-class winter sports, hot spring resorts, golf courses and other outdoor activities. Best Western Hotels & Resorts headquartered in Phoenix, Arizona, is a privately held hotel brand with a global network of 4,200* hotels in more than 100* countries and territories worldwide. Best Western offers 11 hotel brands to suit the needs of developers and guests in every market: Best Western®, Best Western Plus®, Best Western Premier®, Vīb®, GLō®, Executive Residency by Best Western®, BW Premier Collection®, and BW Signature CollectionSM by Best Western; as well as its recently launched franchise offerings: SureStay® Hotel by Best Western, SureStay Plus® Hotel by Best Western and SureStay CollectionSM by Best Western. Now celebrating more than 70 years of hospitality, Best Western provides its hoteliers with global operational, sales and marketing support, and award-winning online and mobile booking capabilities. Best Western continues to set industry records regarding awards and accolades, including 64 percent of the brand’s North American hotels earning a TripAdvisor® Certificate of Excellence award in 2017, Business Travel News® ranking Best Western Plus and Best Western number one in upper-mid-price and mid-price hotel brands, and Best Western receiving seven consecutive Dynatrace® Best of the Web awards for its leading hotel website. Best Western has also won nine consecutive AAA®/CAA® Lodging Partner of the Year awards, recognizing the brand’s commitment to providing exceptional service and great value to AAA/CAA’s nearly 58 million members in the U.S. and Canada. Best Western-branded hotels were top ranked in J.D. Power’s 2017 North America Hotel Guest Satisfaction Index Study – ranking first in breakfast (food and beverage category) for midscale; and second in overall guest satisfaction. Over 32 million travelers are members of the brand’s award-winning loyalty program Best Western Rewards®, one of the few programs in which members earn points that never expire and can be redeemed at any Best Western hotel worldwide. Best Western’s partnerships with AAA/CAA and Harley-Davidson® provide travelers with exciting ways to interact with the brand. Through its partnership with Google® Street View, Best Western is the first major company of its size and scale to launch a virtual reality experience for customers, setting a new industry standard and reinventing how guests view hotels.